People who are vegans, allergic to milk or looking for dairy-free milk substitutes will enjoy the benefits of almond milk. This great alternative to dairy milk is made from almond nuts and is therefore low in fat and calories. However, it is a fortified beverage that is rich in vitamins as well as minerals like calcium. Almond milk is not only good to drink; it is suitable for adding to recipes that need milk as an ingredient, since it is rich and creamy. You’ll find out the almond milk benefits as well as how to make it. Almond milk, when taken without additives like sugar or flavoring, only contains 60 calories for every 8-ounce serving. Therefore, if you are looking for a beverage that will help you lose or maintain your weight, take almond milk instead of cow’s milk. This milk substitute contains zero cholesterol, which reduces your risk of accumulating bad cholesterol and heart disease. Furthermore, it is low in salt or sodium (5 mg/serving) but high in potassium (150 mg/serving), which help maintain normal blood pressure and prevent heart disease. Compared to other milk alternatives, plain almond milk is low in carbohydrates (8 grams/serving). Therefore, drinking this type of milk does not increase blood sugar levels significantly and reduces your risk for diabetes. Its low glycemic content enables the body to digest and use the carbohydrates as energy, so that sugars are not stored as fat. Almond milk is good for bone health because it provides 30% of the recommended daily amount (RDA) for calcium and 25% of RDA for vitamin D. These nutrients help build stronger bones and reduce the risk for osteoporosis, a condition characterized by weak bones. Almond milk also contains magnesium, a mineral that enhances the absorption of calcium in the body. Aside from these, vitamin D helps improve immune function and prevent chronic diseases, including Alzheimer’s disease. Almond milk provides 50% of the RDA of vitamin E per serving. This nutrient possesses antioxidant properties and helps in the regulation of vitamin A availability and use, both of which are essential in skin health. Almond milk contains moderate amounts of vitamin A, which helps maintain proper eye function. Almond milk contains only1 gram protein/serving, but provides lots of B vitamins such as riboflavin, and iron. These nutrients provide for muscle energy, plus growth and repair. Iron also helps regulate other cell functions such as oxygen absorption in the blood. Some people do not like the taste of dairy milk and look for other products that taste different. 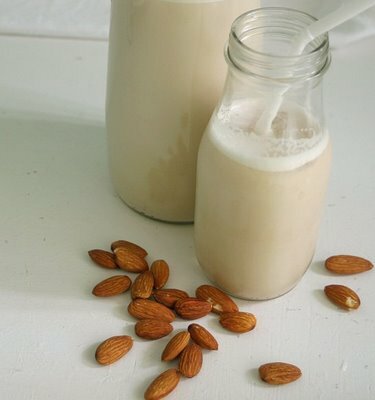 Almond milk has a unique nutty flavor that is light but crisp. At the same time, it has a creamy consistency that is similar to milk, which you will enjoy with your coffee or other foods. Unlike dairy milk that needs refrigeration to prevent it from spoiling, almond milk can be kept on a shelf with other dry foods. It is therefore easy to store and good to take for camping or road trips. Soymilk is often used as a milk substitute, but some experts believe that it is not that healthy. It may contain more sugar than you need and almond milk may be a better choice since it is low in fat, sugar, and calories. People who are lactose intolerant have problems digesting dairy milk, which makes them gassy, bloated, and sick. Other people may also be allergic to other components of milk. Therefore, almond milk may be a great milk alternative because it contains no lactose and it is easily digested.